Orust, south west Sweden, has a long tradition of boat building. Since the middle of last century, some of the world’s most beautiful sailing yachts have been built there, according to Ferenc Matè. Of these, the Vindø boats from the Nötesund yard were probably the most beautiful until the end of the production in the late 1980s. The 45 is included in Ferenc Maté’s The World’s Best Sailing Boats. The boats have a classic look, with a high priority on woodwork and craftmanship, as well as being reliable and good to sail. Their heydays were from the late 60s until the end of the 80s. The yard developed and built long keeled boats, in the range of 28 – 38 feet. They are designated by sail area, as was common at the time. The 32, 50, 40, and 45 are the best known. They also built a few bigger boats, the 65 and 75. The hulls are in heavy duty GRP, and the superstructure was invariably made from mahogany, with teak decks. This made the boats very beautiful, but also expensive to build and a challenge to maintain. Other yards, like Hallberg Rassy and Najad, also built good yachts, but without the same amount of woodwork and at a lower price. Vindø continued building the same high quality boats but to compete with these newer designs sold them at a loss. By the mid 80s the yard had to give in and the first bankruptcy was a fact. New owners made a new start and developed a more modern design, the 995, with superstructre in GRP. Otherwise, it has the same quality as the former Vindøs, and below it is exactly the same standard as before, with all the interior hand made from teak and mahogany. The 995 (which indicates the over all length in cm) is semi long keeled, which makes her easier to maneuver in tight spots, but still easy to sail on a steady course. She is also a bit wider than the 40 and 50, which gives her more volume below. However, the market was tight in the late 80s, and they built only three 995s unilt they had to give in again. Our boat is the first of these three, built 1987-88. A few more boats were built at another place at Orust in the 1990s. These have a doghouse. So all in all, less than 995s were built, and these were the last Vindøs. Wednesday November 25 2015 I had the opportunity to visit Vindø Marin, at Orust on the Swedish west coast. This is where our Vindø 995, Vestavind, was built in 1987/88. 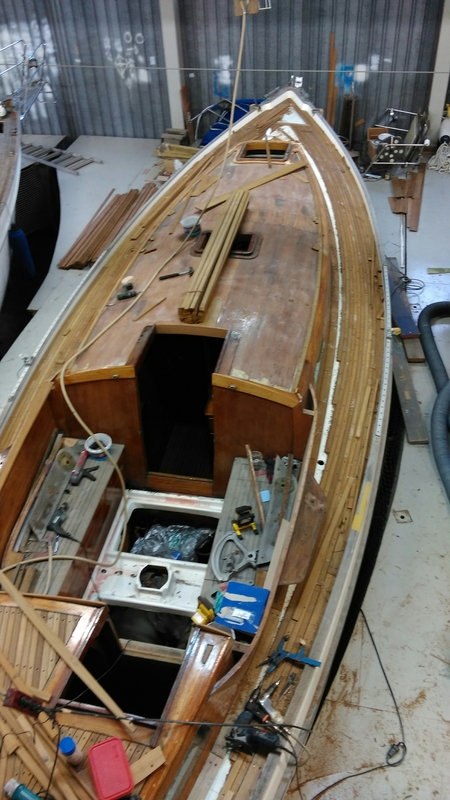 The yard does not build new boats now, in fact the 995 was the last boats that were built before the yard went bankrupt 1988. Only three 995s were built there, according to Peter, who showed me around. Vestavind was hull no 1. 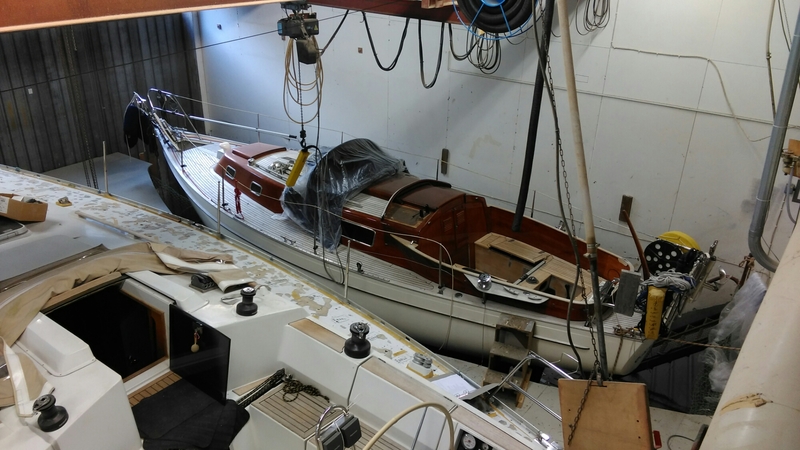 Hull no 3 is currently for sale in Oslo (April 2016). 1994-95 a few more boats were built another place at Orust, Peter had worked there. Some of them have a pilot house. Now they do maintenance of old Vindøs and other yachts. 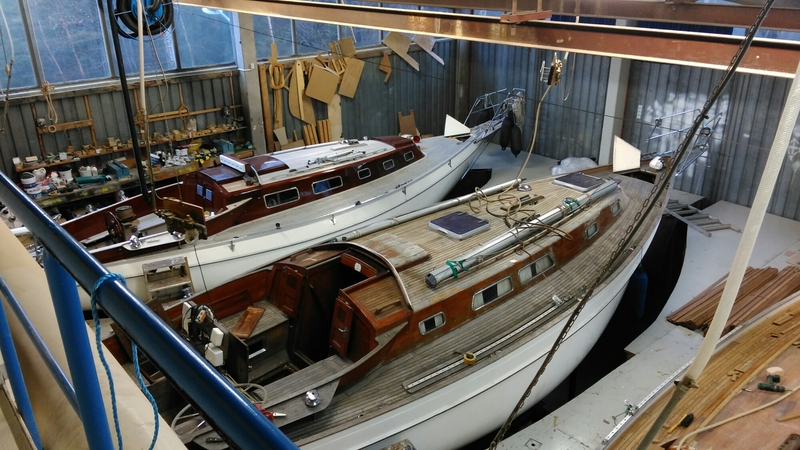 When I was there, four Vindøs were in the workshop, two 32s, one 45 and one 50. This is the place where our 995 was built! They still have the exact same woodworking machines as back then, according to Peter. Here is an article about Vindø from Ferenc Maté: The World’s Best Sailboats. Volume I. The book was published before the first bankruptcy.